Welcome to this special two-disc programme featuring not only London’s ‘New Routemaster’ (LT) but also the original Routemasters operating on the two heritage services in London and on the bonus disc, the Yutong Citymasters in service in Skopje, Macedonia. Our filming starts in central London on the 23rd August 2013. We see the ‘New Routemasters’ on route 24, the first route to be converted to this type of bus in full following the trials of the 8 prototypes introduced on the 38 running between Victoria and Hackney Central in late 2011 and early 2012. Filming locations for route 24 include Tottenham Court Road, Trafalgar Square, Whitehall, Parliament Square and Victoria Street. At Piccadilly and Piccadilly Circus we also catch up with some of the original prototypes on the 38 in ‘one person operation’ mode with their rear doors closed. Our cameras returned to London on 24th July 2014, which was also the penultimate day of the Routemaster heritage service 9. By now the following routes are running with ‘New Routemasters’ – 8, 9, 10, 11, 24, 38, 148 and the 390. Filming locations include Aldwych, Strand and Trafalgar Square before we board RM1776 (776 DYE) for a ride to the busy Hyde Park Corner for more action. Victoria is the next stop where we see RT191 (HLW 178) working on ‘The Wartime London Tour’. Yet more LTs are seen in Victoria Street on the 11, 24 and 148, and on Buckingham Palace Road where we see a number of LTs on the 38, some wearing all over black liveries advertising a well known sporting brand. We now board a ‘New Routemaster’, LT236 (LTZ 1236) on the 38 to Hyde Park Corner in order to catch the 9 service to Kensington High Street. Operated by silver liveried SRM3 (650 DYE) we enjoy the sounds from the lower deck on the way to our destination. After filming both New and old Routemasters at the layover stop in Kensington High Street for the 9 we board RM1913 (ALD 913B) for the ride back to Hyde Park Corner. Our final location for the day is Marble Arch with plenty of action featuring the ‘New Routemasters’ as well as a whole host of new and older current London buses. Our bonus disc is a real treat for you! In late August 2014 the independent transport videos cameras paid a visit to Skopje the capital city of Macedonia in the former Yugoslavia. Introduced in 2011, the Yutong Citymaster is a mirror image ‘Routemaster look-alike’. Manufactured in China these buses were purchased to give the city a ‘retro-look’ to match the new retro style buildings currently being built all over the city. In the 1950s London Transport sent their entire STD class of double deckers to Yugoslavia to help the county’s transport back on its feet after the devastation of the Second World War, so these buses are somewhat of a salute to the past. Our cameras film them in action in the city, and take two rides, one half way up a mountain to the Millennium Cross cable car station, the other to a small village just out of the city centre. They are very nice vehicles. Excellent pulling power and efficient air con – it was 36C degrees on the day of filming! 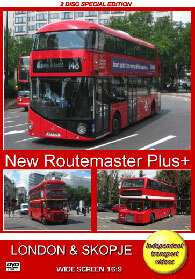 We hope you enjoy the New Routemasters Plus programme.